MARKET ECONOMY: It is an economic system, in which all material means of production are owned and operated by the private with profit motive. ECONOMIC PROBLEM: “An economic problem is basically the problem of choice” which arises due to scarcity of resources having alternative uses”. SCARCITY OF RESOURCES: Scarcity of resources means shortage of resources in relation to their demand. OPPORTUNITY COST: It is the cost of next best alternative foregone. POSITIVE ECONOMICS: Positive economics deals with what is, what was (or) how an economic problem facing the society is actually solved. NORMATIVE ECONOMICS: It deals with what ought to be (or) how an economic problem should be solved. Ans : – Economics is the study of the problem of choice arising out of scarcity of resources having alternative uses. Ans : – Scarcity means shortage of resources in relation to their demand is called scarcity. Ans : – An economy is a system by which people get their living. Ans : – Central problem is concerned with the problems of choice (or) the problem of resource allocation. What do you understand by positive economic analysis? Ans : – It deals with what is (or) how an economic problem facing an economy is solved. It analyses the cause of effect relationship. What do you understand by normative economic analysis? Ans : – Normative economic analysis deals with what ought to be (or) how an economic problem should be solved. Give one reason which gives rise to economic problems? Ans : – Scarcity of resources which have alternative uses. Name the three central problems of an economy. Ans : – i) What to produce? Ans : – It is the cost of next best alternative foregone. Why is there a need for economizing of resources? Ans : – Resources are scarce in comparison to their demand, therefore it is necessary to use resources in the best possible manner without wasting it. What is production possibility frontier? Ans : – It is a boundary line which shows the various combinations of two goods which can be produced with the help of given resources and technology. Why PPC is concave to the origin? Ans :- PPC is concave to the origin because of increased marginal opportunity cost. Define marginal rate of transformation. What does a point inside the PPC indicate? 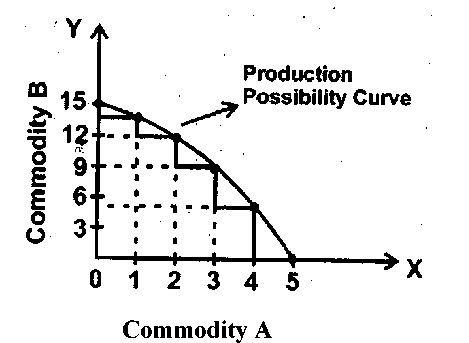 Ans :- Any point inside the production possibility curve indicate underutilization of resources. What do you mean by the problem of what to produce? Ans :- It is the problem of choosing which goods and services should be produced in what quantities. What do you understand by the problem of how to produce? Ans :- It is the problem of choosing technique of production of goods and services. What does the problem for whom to produce indicate? Ans The problem of for whom to produce refers to the distribution of goods and services produced in the economy. Give two examples each of micro economics & macroeconomics. What does a rightward shift of PPC indicate? What is meant by economising of resources? Ans :- It means making best use of available resources. Ans :- It is a boundary line which shows that maximum combination of two goods which can be produced with the help of given resources and technology at a given period of time. Ans. Every point on PP curve like ABCDEF indicates full employment and efficient uses of resources. Any point below or inside PP curve like G underutilization of resources. Any point above PP curves like H indicates growth of resources. It refers to a curve which shows the various production possibilities that can be produced with given resources and technology. 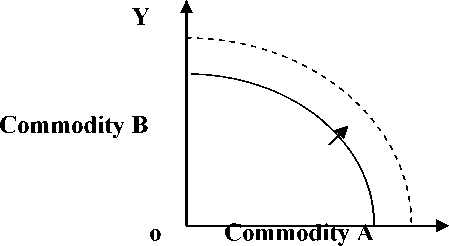 If we want to produce more commodity B, we have to reduce the output of commodity A & vice versa. 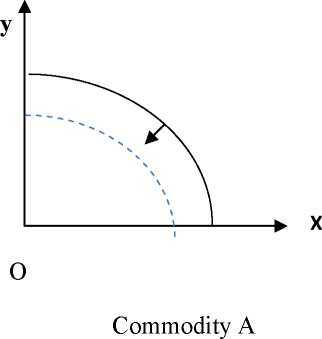 Shape of PP curve and marginal opportunity cost. PP curve is a downward sloping curve. In a full employment economy, more of one goods can be obtained only by giving up the production of other goods. It is not possible to increase the production of both of them with the given resources. The shape of the production possibility curve is concave to the origin. The opportunity cost for a commodity is the amount of other commodity that has been foregone in order to produce the first. The marginal opportunity cost of a particular good along the PPC is defined as the amount sacrificed of the other good per unit increase in the production of the good in question. Example: Suppose a doctor having a private clinic in Delhi is earning Rs. 5lakhs annually. There are two other alternatives for him. Joining a Govt. hospital in Bangalore earning Rs. 4 lakhs annually. Opening a clinic in his home town in Mysore and earning 3 lakhs annually. The opportunity cost will be joining Govt. hospital in Bangalore. Increasing marginal opportunity cost implies that PPC is concave. When there is improvement in technology. 3. Distinguish between a centrally planned economy and a market economy. All the materials means of production are owned by government. All the materials means of production are owned by private individuals. Main objectives of production are maximization of profit. Ownership of property is under government control. There is no limit to private ownership of property. 4. Distinguish between micro economics and macroeconomics. It studies individual economic unit. It deals with determination of general price level and output in the economy. Its central problems are price determination and allocation of resources. Its central problem is determination of level of Income and employment in the economy. Does massive unemployment shift the PPC to the left? Ans:- Massive unemployment will shift the PPC to the left because labour force remains underutilized. 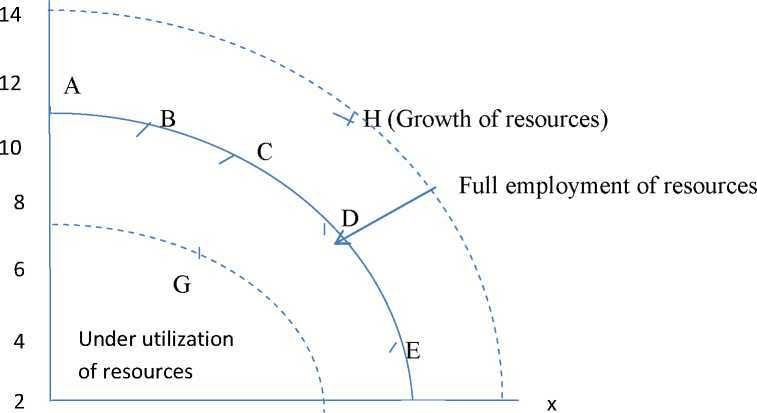 The economy will produce inside the PPC indicating underutilization of resources. What does the slope of PPC show? Ans. 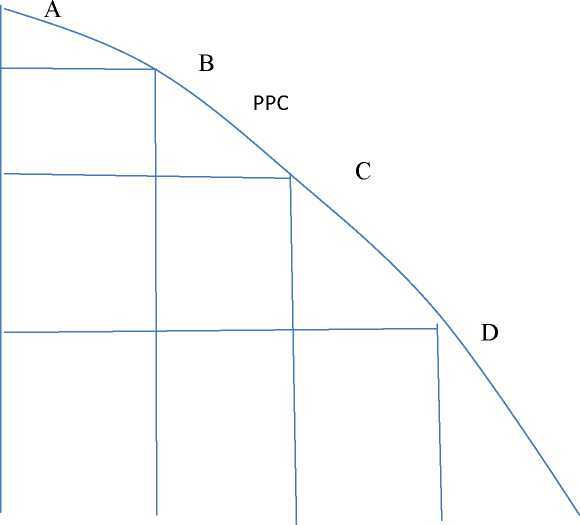 The slope of PPC indicates the increasing marginal opportunity cost. From the following PP schedule calculate MRT of good x. How are fundamental problems solved in the capitalistic economy. In a market-oriented or capitalist economy, the fundamental problems are solved by the market mechanism. Price is influenced by the market forces of demand and supply. These forces help to decide what, how and for whom to produce. How are fundamental problems solved in the planned economy? In a planned economy all the economic decisions regarding what, how and for whom to produce are solved by the state through planning. Economic planning replaces the price mechanism. The market is regulated by the state. The prices of the various products are fixed by the state called administered prices.